Liviu’s love of physics was inspired by his father, also a physics teacher, while in communist Romania. At 26 he moved to the US and, after two masters degrees (one obtained in Romania and one in the US), he began classroom teaching. His approach is based on entertaining his audience and using real-life scenarios, which ensures students’ attention and makes lessons more memorable at the same time. He injects stories from his own youth and worldwide travels into his teaching, combining physics concepts with learning about other cultures. During his tenure, enrolment in AP physics classes has soared and his students’ AP mean scores have always been above and sometimes well above Indiana and global ones. In 2008 he developed an initiative called “Power of Physics” (POP). It consists of social media videos of intriguing experiments to promote the importance of physics in an entertaining way. Liviu also takes to the road for annual POP shows that he presents with a student team to elementary and high school students as well as the wider community. 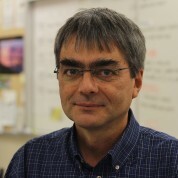 POP was awarded grants from the American Association of Physics Teachers and has been presented in Denmark as part of EuroPhysicsFun, American Institute of Physics (William F. and Edith R. Meggers Project Award – $5,000), and (portions of) two more from Lilly Endowment ($8,000 and $25,000). Liviu’s work has been recognised with the Presidential Award for Excellence in Mathematics and Science Teaching. He is equally proud that his students have gone on to become fighter pilots and aeronautical engineers at SpaceX. Join the #TeachersMatter movement by sharing Liviu Haiducu’s update.